We made it out of Miami! Kimmie Lou got a little work done in St Petersburg, “what the heck is a doohickey” said the service manager as we laid a bag of parts on the counter. Ridicu took over saying “it’s one of these here thingy-kabobs that keeps tension on Kimmie Lou’s leash”…”chain” I added quickly. It’s a stronger cam and springs from Eagle Mike to replace the lighter stuff Kawasaki put in the 2008 (Parts apparently beefed up from 2009 onward). Then I went on to mention Happy Trails and KLR 650.net ……the service guy’s eyes widened a bit (Oh, it’s one of these Thumper Cult Characters, he was probably thinking). We really appreciate you submitting two comments, it’s really nice when someone is sensitive to dual personalities. Here at RidicuRyder we were astounded by all the aggravated viewers calling in concerns similar to yours for a couple of days after releasing our post. Now that our switchboards have finally cooled off, we would like to set the record straight. First, we must firmly state that Kimmie Lou is proud of her Asian heritage, she only sasses up her Japanese accent for fun (your abortion reference was poorly recieved but she eventually saw you were just kidding after we cleaned her air filter with Bombay Sapphire and tonic 6 or 7 times). Next we would like to emphasize that we are as (if not more) challenged by Mental Health issues than all of you who remained sleepless for days after publication. We will be undergoing rigorous Moto-Therapy for weeks prescribed for us by a renowned Buddhist Biker / Wedding Photographer who never brings film (and won’t go digital) – we just hope to make it out in two images. A little known Obstetrical loophole exists for women who desire “off the grid” pregnancies and before we go any further we must, as Health Care Professionals, insist that anyone breathing – at this moment, immeadiately consult a physician. Furthermore, it is agreed by anyone reading on, that methods outlined are of an artistic, non-reliable yet highly provocative nature and are only undertaken after whatever magic 8 ball decision-making protocols you prefer are peeled out. If a woman times the conception of her child so that a full moon rises on the last day of her first trimester…..and she dances with total abandon but precise steps (Irish Jigs generally work best) at midnight, she can request a species switch for her fetus. Really good dancers (like Kimmie Lou’s Mom) can even ask to give rise to a machine. Now it must be stressed that this isn’t for the faint-hearted….once a request is made, irreversible consequences are set into motion. When Kimmie Lou’s Mom said “2008 Kawasaki KLR 650” she knew that the Corked Stork may have replied “Vespa” and that was what she would have been stuck with. This stuff isn’t dreamy-doll time……request a cuddly Koala and the reply might be “Aardvark” – just so everybody knows what they are in for. After Kimmie Lou’s Mom did her spectacular dance and was granted her wish, she said goodbye to her friends, family and Lover Lou (who?) so that she could journey to the Himilayas. After a few days of trekking, the excruciating transformation began. One morning Kimmie Lou’s Mom awoke in a cave without the pain that had been with her for weeks…..she stood up a tall 17 7/8 feet as a fully formed Yeti capable of delivering a full size dual sport motorcycle. Yeti-ma (as she likes to be called) has never looked back, she likes her new life and is content to live out her years nibbling on the occasional Mountaineer and refining her language skills (we Nepal-exed her Rosetta Stone Swahili a while back and it has been keeping her pretty busy). 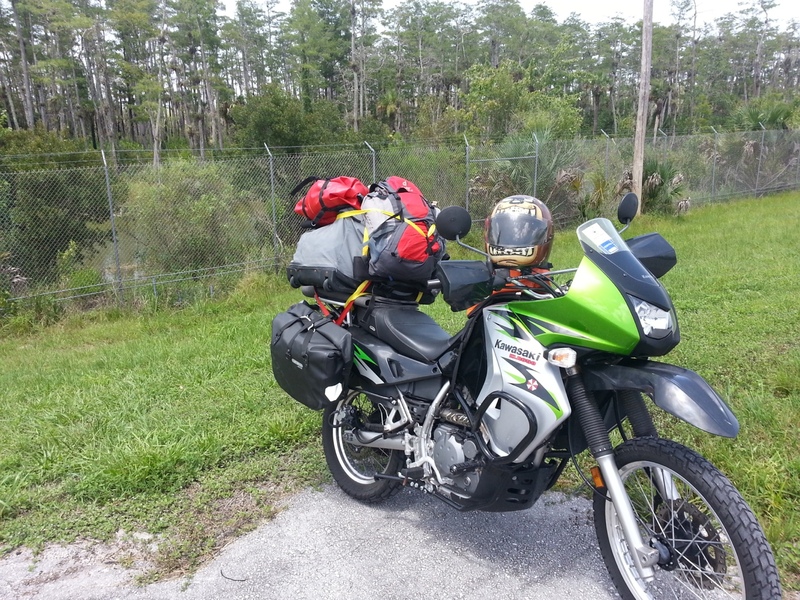 Tags: Aardvark, Alligators, Asian Pride, Bombay Sapphire, Buddhism, Eagle Mike Manufacturing, Happy Trails, Himilayas, Irish Jigs, Japanese Heritage, KLR 650.net, Koala, Mental Health, Obstetrics, Ortlieb Quick Release Motorcycle Panniers, Rosetta Stone, St Pete Powersports, St Petersburg, Swahili, Vespa, Yeti | Permalink. it blesseth him who rides his klr, and he who aspires to ride …..
if you load up the back even more, it will be easier to do wheelies ! if you really pile on the bags, you could ride it like a unicycle, steering by balance…. how cool is that ! Demsdabreaks Desdamona is the only line I remember from Shakespeare. I’m crystal. Well, at least on the fact that your mind is a very strange but kind of cool place to visit. About a motorcycle birthing Yeti, still searching a bit through the fog for that one. Yetis, Bigfoot and certain Mashed Potatoes are among my favorite Mystical experiences. Nice to have you along for the ride!